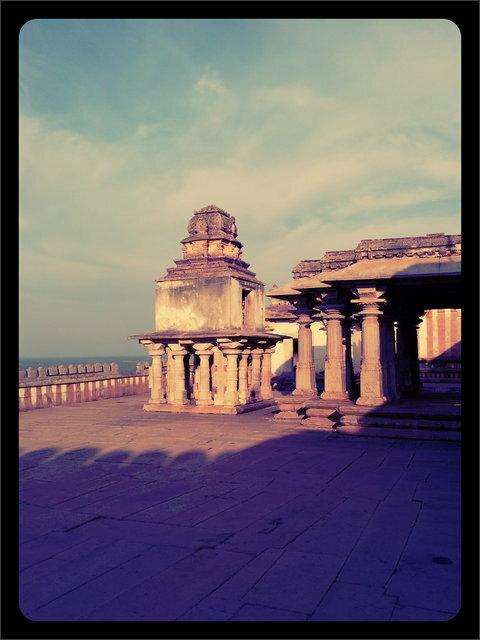 Karnataka and it’s beauty… always is amazing. I love every bit of it. This was another huge sculpture / statue that I had in mind and wanted to visit this for a long time… From Bangalore, I took a bus to Hassan. There are direct buses to Charannayapatna from Majestic bus stop in Bangalore, but very few and the one at 8:00 AM had already left. From Charannayapatna, there are local buses which take 15 bucks to Shravanbelagola. Nonetheless, I decided to go to Hassan. It takes about 4 hours to reach Hassan and from there you get a lot of buses to Charannayapatna, Haleibedu, & Belur as well. Once I reached Shravanbelagola, I decided to check in to a local restaurant at the foothills of the Gomateshwara statue… Really dirt cheap room for Rs. 200 bucks a night. Awesome!!! 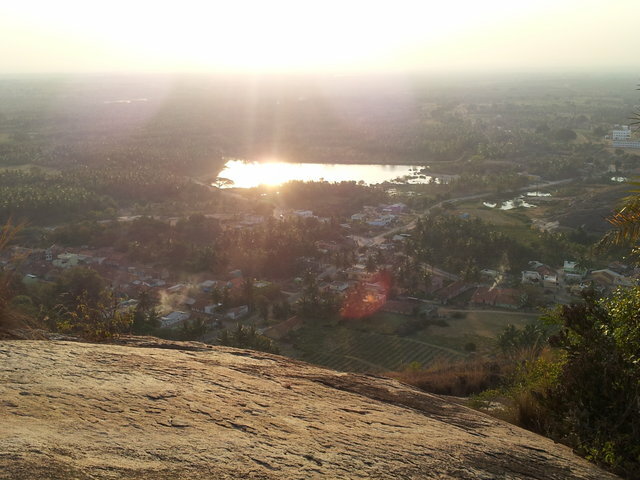 I had enough time to climb the top of the hill and hang out till sunset to experience the beauty of Shravanbelagola & Gomateshwara! Shravanbelagola is a well known place of pilgrimage which gets tourists from all the world. People from allover the country visit this place. The world famous image of Gommateshwara is here. 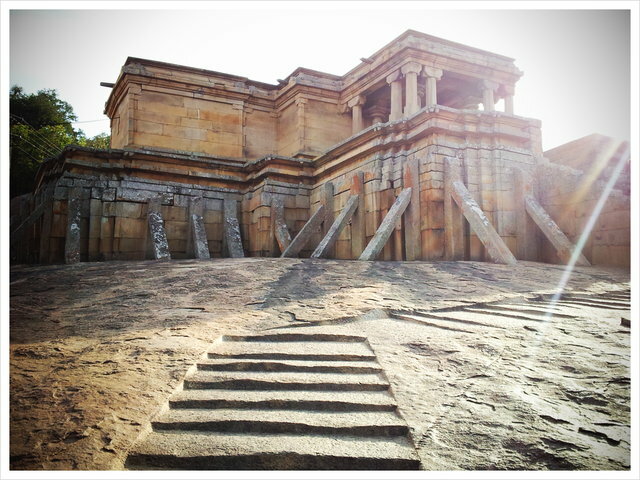 ZVery ancient and beautiful Jaina temples are here. This is a sacred place especially for Jains. Also very famoys is the occasion of “Mahamastakabhisheka” (great head ablution ceremony), it’s every twelve years. The first thing which meets our eyes as we enter Shravanbelagola is a big lake. Beautiful steps have been constructed around it. A fort and also “Kala Mantapas” surround it. This lake is called ‘Sveta Sarovara’ or white lake. It’s Kannada equivalent is ‘Biliya Kola’ or Belagola’. 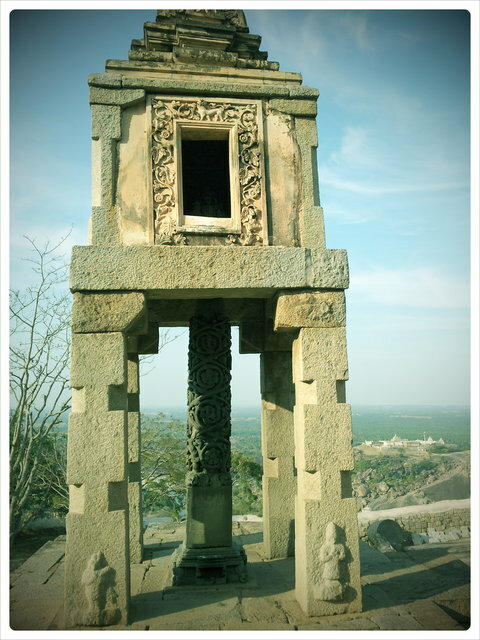 the place connected with Shravana or Jain ascetics. Hence the name Shravana – Belagola. We see the beautiful and artistic statue of Sri Gommateshwara Swamy on the summit of Indragiri. Gommateshwara is also called Bahubali. According to Jainism theology, there was a period in the world when happiness and peace reign supreme. Truth and dharma flourished during that period. It was called Utsarpini. There was another time when justice, truth and goodness decline everywhere. This period is termed Avasarpini. During this time of deterioration, twenty four Thirthankaras (realized souls) incarnate this world and guide people in the right path, by teaching them canons of truth and dharma. Sunanda gave birth to a son by name Bahubali and a daughter by name Saundari. Vrishabha ruled over his Kingdom with pomp and pleasures for many years. After a while he renounced the world. While he did so, he made his elder son Bharata the King. Bahubali was crowned as the Yuvaraja (Heir apparent). Bharata conquered the whole world and in his conquest of the world he also waged war against his brother as he was told by the priests that there were enemies within the city and they were not submissive to Bharata. They were none other than his brothers. All of his brothers were disgusted by Bharatha, and renounced their kingdom to join their father, except Bahubali. He came to fight Bharatha. Battke was about to take place between the armies of Bharatha and Bahubali. At that moment the ministers fearing that both armies would suffer heavy losses in the battle suggested that only the two Bharatha and Bahubali – might fight other. The winner would be the emperor. The last battle was to be fought by hitting heads with fists. Bharat had the first shot, because he was older than Bahubali, which knocked Bahubali nearly to the ground. Then, it was Bahubali’s turn. Bahubali’s name means ‘Bahu’ – Arm, and ‘Bali’ – Strength, he was known for the immense strength of his arm. Everybody knew and worried, that if Bahubali’s blows struck Bharat, Bharat would probably die. This contest could have been easily won by Bahubali striking Bharat. But as Bahubali raised his arm to land a blow, he paused, realizing that fighting his elder brother for land, wealth, and power was neither sane nor righteous. Indeed, it would have been a grievous moral failure for a son of a Tirthankara. As a rule for a Kshatriya, once he has taken action, it is not possible for him to withdraw or retreat. So, instead of landing a blow on his older brother with his raised arm, he simply changed direction, pulling out his own hair with the same hand, thus avoiding striking Bharat. With this, he put aside all of his possessions, and became a solitary renunciant. Learning from this example, Bharat came to understand the folly of his greed for land, money, and power forgiving his younger brother. Bharat continued to ruled for some time, until eventually joining Lord Rishabdev as a solitary renunciant. The fight with his brother troubled Bahubali, so after much contemplation, he decided to give up his kingdom and take up the ascetic life. He took to meditation with a thirst for truth, but – it was for ego that he took to meditation on his own. Overall this is a place where you will feel totally amazed, amazed by the serenity and peace that it has to offer. The magnificence and silence at which the Bahubali statue stands… You’ll feel really amazed by the amazing carved black stone statues of 24th Thirthankaras inside. After visiting the temple I decided to explore the cliff at the back of the temple… The sun was about to set and what better place than to sit at the edge of the cliff and ponder into the horizon, reflect upon life thoughts and beauty of everything around me… Just don’t need anything else in the world… than this beautiful memory. 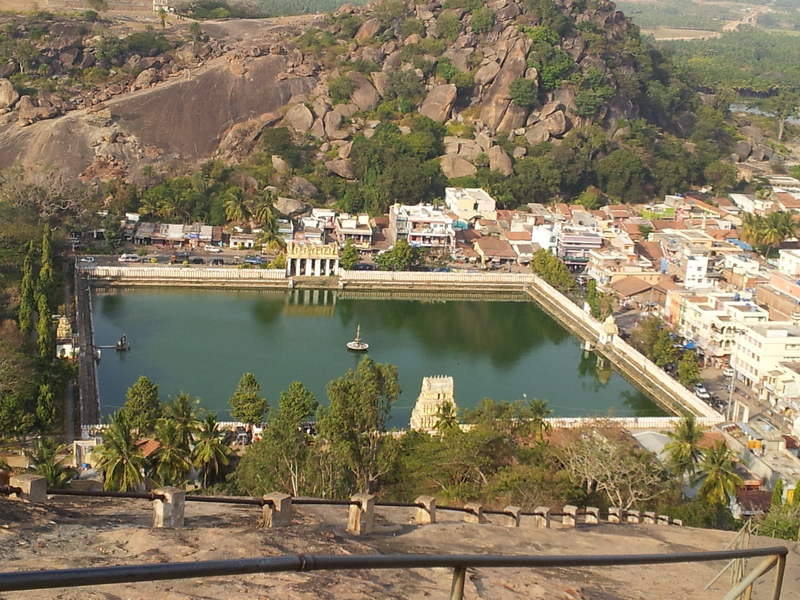 This entry was posted in South and tagged Bahubali, Chandragiri, Gommateshwara, Hassan, India, Indragiri, Jainism, Jains, Karnataka, Monolithic, Shravanabelagola, Statues, Temple, Thirthankaras, Travel, Vindhyagiri on July 18, 2012 by srinistuff. 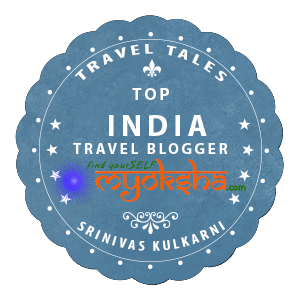 To get my travel tales in your inbox Subscribe Now! Just a writer in love with the majestic Himalayas..
A sliver of Motivation. A snippet of History. A slice of Adventure. And a big dollop of fun. 6 continents. 48 countries. 22 Indian states. 15 years of travel blogging.